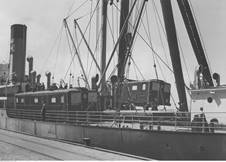 Two EL.100s unloaded from s/s Lublin; Gdynia, 1936. Source: www.commons.wikimedia.org. EL.103, probably in Warsaw; source: as above. EL.102 at the maintenance workshop in Warsaw; source: as above. EL.100 side drawing; source: KMD vol.2-3/2008. EL.102, photographed in Warsaw in August 1936. Source: National Digital Archives (www.nac.gov.pl). Used by permission. Reconstruction of Warsaw railway junction started immediately after WWI, although preliminary plans can be traced back to 1893. It was decided to build a new line, running approximately from west to east, right through the city center, and a new central station. Work began in 1919 and the new line – so-called ‘Diameter Line’ – was opened in September 1933. Electrification of this line had been planned earlier (preliminary studies had been initiated in 1926), but world crisis and lack of funds resulted in considerable delays. First tenders were invited in early 1931, but no contractor was chosen, due to problems with financing. Final contract was signed between PKP and two British companies (English Electric and Metropolitan Vickers) in August 1933 and Contractors Committee for the Electrification of Polish Railways was set up in Warsaw. First electrified line (from Pruszków to Otwock via the Diameter Line, 43.5 km, 3000 V DC) was opened on December 15, 1936; this date is acknowledged as the beginning of electrification of Polish railways, although – strictly speaking – first electrified line was a 32-km track between Grodzisk and Warsaw (600 V DC), opened in December 1927 and operated by a private company. In all, six locomotives were initially ordered. First two (designated EL.101 and EL.102) were built by Metropolitan Vickers and shipped to Gdynia in 1936. Four (EL.103 through EL.106 – factory type 1E) were built by First Locomotive Factory in Poland of Chrzanów, known as Fablok. Electric equipment was supplied by English Electric and assembly of four locomotives in Chrzanów was supervised by British specialists. All six machines were classed EL.100 (after service numbers); it was intended to re-class them E01, but this was never done. They were intended for hauling transit trains through central Warsaw – which in fact was switching – but could be used for line service with passenger or even light freight trains. EL.100 was a simple machine, with riveted body; drawbars and buffers were attached to trucks. There were no provisions for multiple control (double-heading was not planned) and no car heating equipment. 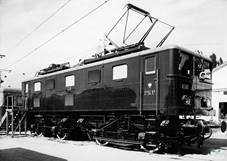 After tests and training, EL.100s entered regular service in October 1937 as first electric locomotives with PKP. They were soon supplemented by four lighter EL.200s. 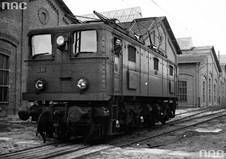 EL.103 – the very first electric locomotive built in Poland – was destroyed during German assault in September 1939. The remaining five machines were impressed into Ostbahn service and re-designated E101 through E106 (in accordance with German standards). They were evacuated westwards in September 1944, but E101 was destroyed during evacuation. E102, E104 and E105 were taken by Germans and never returned; they were written off at the RBD Augsburg in 1952, although according to some reports at least two were seen – albeit in very poor condition – as late as in 1958. 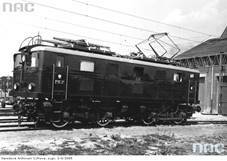 E106 was returned to PKP in 1945 and restored in service. It was used with local passenger trains. After the arrival of new machines (classes E110 and E150 – later EP02 and EP03, respectively) it was transferred to Łódź and remained in service until August 1964; in 1958, in accordance with new relevant Polish standard, it was re-classed EP01. Unfortunately, this historic machine was scrapped at the Łódź Olechów depot, probably in 1968. First electric locomotives in PKP service were perhaps no star performers, but certainly they have a place in history and it is a sad thing that no effort had been made to preserve at least one of them. It is worth mentioning here that both EP02 (built in Poland by Pafawag) and EP03 (from Swedish ASEA company), supplied in the 1950s, stemmed from the same basic design and were similar in appearance and characteristics. 1) Two built by Metropolitan Vickers and four by Fablok.